Commissioners Jack DeWeese, Tony Anderson and Dan Dean brought up issues the county is facing to Congressman Mike Turner, including finances. 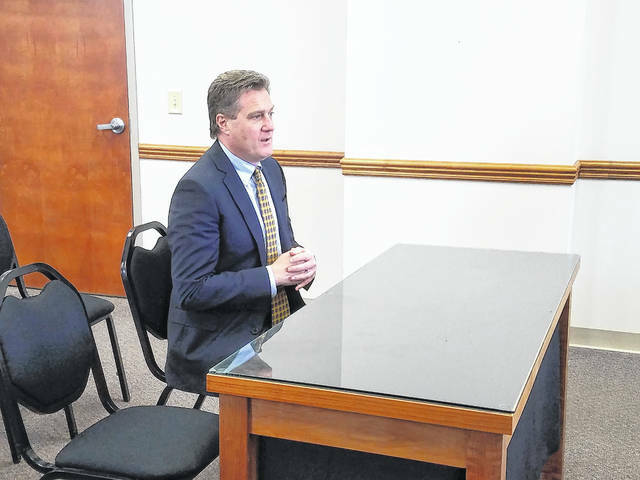 Congressman Mike Turner (R-10th District) spoke with the Fayette County Commissioners Monday afternoon to explain efforts he and his office are making to help with an overburdened foster system and the opioid epidemic. 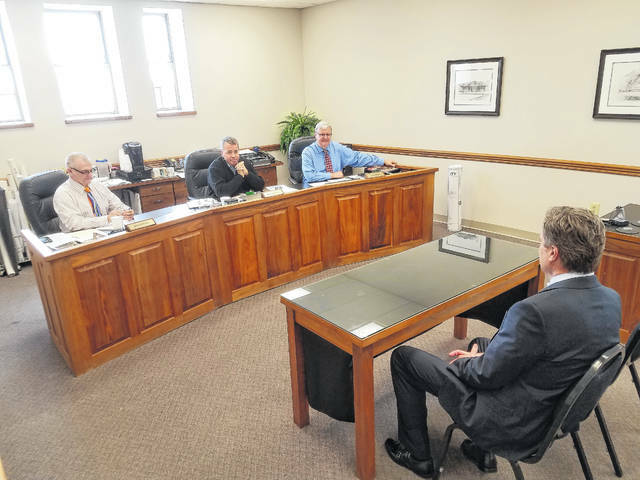 Congressman Mike Turner (R-10th District) visited the Fayette County Commissioners Monday afternoon to discuss finances, the opioid epidemic and other issues facing the community. Turner began by thanking the commissioners for taking time out of their lives to dedicate to public service. He said the work they do serves the future and if anyone wants to find people thinking about the future, they should look no further than local government. Turner then shifted the conversation to Medicaid coverage and how it impacts people in the jail system suffering from opioid addition. The Congressman said when these individuals leave the jail and their Medicaid coverage kicks back in, the chance to directly impact the decision-making of the addicted to help them choose to find treatment is gone. Turner said he attempted to help this situation by putting a bill forward that extends coverage to Medicaid eligible individuals while they are incarcerated for the purpose of treatment. Another issue Turner discussed was the amount of babies being born to heroin users and how that has caused a plethora of other problems. He said working with the Premiere and Kettering health networks, they identified a need for a special unit for babies born addicted to heroin. With the need for more direct care, a quiet environment and more intensive nurse interactions, Turner said a hospital is not the place for such treatments. The Congressman next turned his attention to their efforts to help the foster child population. One issue they have found is federally created homelessness due to two separate organizations not working in conjunction; foster care taken care of by the U.S. Department of Health and Human Services and adult housing assistance taken care of by the U.S. Department of Housing and Urban Development (HUD). The commissioners then took time to address with Turner some of the issues the county faces. The first of these is the rise in children within the foster system and its impact on the budget. The amount of children has more than doubled within the Fayette County system, according to commissioner Dan Dean. Dean said the three commissioners have heard of surrounding counties also needing to dig into their funds to pay extra money for these services. Turner then asked if this rise in children within the system is due to the opioid epidemic. The commissioners also discussed the recent changes to Medicaid managed care and sales tax within the state and its impact on the local budget. Currently, besides the more than $600,000 lost, the commissioners have estimated an additional loss of around $1 million this year. Though the dependence on the sales tax has lowered over the years, a good portion still factors into the financial state of the county. This is important for a number of reasons, but one of the issues mentioned to Turner is now the county is going to go to the voters to pay for services related to the hospital and EMS within the county. Commissioner Jack DeWeese said maybe they should have come to the voters sooner, but they have always been able to budget and pay for these important services with money available. With the aforementioned changes to the sales tax, the hospital being penalized for EMS not being deemed “critical access” and other financial factors, the money to continue to support a county-wide EMS service is dwindling. The commissioners voiced these concerns to Turner, who said he would begin looking into these problems, as they believe the county-wide system is crucial to maintaining a good emergency management service. Issues aside, the commissioners thanked Turner and his office for working so well with them over the years. They additionally commented on the changes to Medicaid eligibility for the incarcerated, saying it will greatly help the county. Stay with the Record-Herald for more coverage of the Fayette County Commissioners. For more information contact The Fayette County Commissioners’ Office, located at 133 S. Main St., suite 401 in Washington Court House. Their office hours are Monday through Friday, 8 a.m. to 4 p.m. and they can be reached at (740) 335-0720.
https://www.recordherald.com/wp-content/uploads/sites/27/2018/04/web1_20180402_130010.jpgCommissioners Jack DeWeese, Tony Anderson and Dan Dean brought up issues the county is facing to Congressman Mike Turner, including finances. https://www.recordherald.com/wp-content/uploads/sites/27/2018/04/web1_20180402_130041.jpgCongressman Mike Turner (R-10th District) spoke with the Fayette County Commissioners Monday afternoon to explain efforts he and his office are making to help with an overburdened foster system and the opioid epidemic.